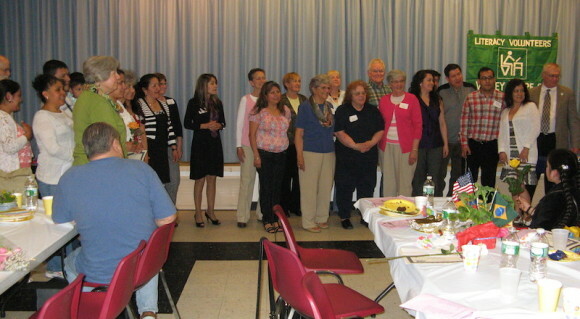 On Wednesday, May 14 approximately 80 students, tutors, volunteers and friends gathered at St. Mary’s church in Clinton for their annual International Dinner and Student Awards ceremony. Diners enjoyed delicacies from such countries as Ecuador, Columbia, Brazil and China. Awards were given for Outstanding Student Participation and Citizenship. Additionally, the dinner is the culmination of the student essay contest with winners in each contest reading their works in front of their peers. If there could be a single event, which describes the impact LVVS volunteer tutors have on their community and that validates the mission of LVVS, this is that event. The Outstanding Student Participation Awards were given to those who achieved goals they had set for themselves at the beginning of year. Some achieved long-term goals, such as gaining U.S. citizenship while others realized short-term goals such as obtaining a library card. Many of the students improved their employment status because of their increased English speaking skills while others can now communicate in English with their children’s teachers or with doctors. A full list of the essay winners, outstanding participation and citizenship recipients can be found at www.vsliteracy.org.